Even though this soap is called “Northern Lights”, it doesn’t share the scent with the beautiful long, purple bath bomb of the same name from a couple of Christmases ago. This soap has pine, cypress and lime. I absolutely love the scent of this soap. Lush Times: We have an ongoing obsession, here at Lush, with the Northern Lights. Many a trip has been taken, but rarely have they been observed. Meaning they have become something of a holy grail for us. So yet again, we are left trying to recreate them in soap, rather than watch them in real life. But it does mean that you get amazing wonderful soaps from us. This soap was made by Wesley, who perfectly matched the colours of the auroras he watched on the internet, and then found a special way to pour the soap to represent the natural light show. Then Pia, our trainee perfumer from Finland, came up with an electric, fresh pine and lime perfume to finish off Wesley’s work. Together they will make you feel like you are in the crisp climes of the arctic circle, with nature’s amazing light show performing about you. 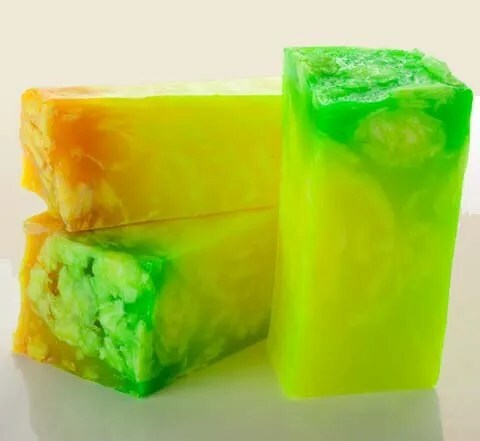 Posted on July 1, 2015 by Lushalot	• This entry was posted in Lush Kitchen menus and product demos, Soaps and tagged cypress oil, Lime oil, lush kitchen, northern lights soap, pine, yellow. Bookmark the permalink.